St. Regis is love ❤! This premier resort in Laguna Beach, Dana Point has so many to offer for the entire family. Named after the Monarch butterfly, St. Regis Monarch has championship golf course, private beach, kids activities, spa, butler service, and more. Refined. Luxurious. Private. This resort is also popular for weddings and honeymoon. This massive fountain is magical at night, romantic for a night walk. Chocolates with butterfly wrapping, teas and cookies with gold dust were some of the welcome treats that we enjoyed! It was summer when we stayed there. St. Regis boasts of more fun activities for kids than any luxury hotels. They held this “Butterfly Release” every Saturday that summer. It was to commemorate the breeding ground of monarch butterflies which is within the resort’s property. It started with a little procession from lobby to the ocean terrace. Then the butler read the story about the legend of monarch butterflies. Then butterflies were released. Some kids are afraid like this little boy. Some kids want to catch all. Another butler walked around giving butterflies in envelope to kids. He told Michelle to make a wish and then release the butterfly. Welcoming the adults to the venue, there were unlimited champagne offered by the servers. Cheers! At night, kids and parents alike are treated to some storytelling and unlimited s’mores. Awesome night for guests! Pools are big, warm and has music underneath the water. Really cool! Mich didn’t want to go home. To go to the private beach area, you have to schedule a golf cart service. It’s quite a drive going to the beach and one can’t just go there by foot. It’s so nice that even toys and sand buckets are provided for each child guest. St. Regis, one of the best! Till next time. Sequoia National Park is home to giant trees including the world’s largest, General Sherman tree. This park lies side by side with Kings Canyon National Park in Southern Sierra Nevada in California. This place is magical. It’s not ordinary to see humongous living things like what you can see here. You’ll be in awe. You’ll try to comprehend. And you won’t forget. We were already amazed at how big the Sentinel is, but it is just an average-sized tree here. Oh, well, biggie size in America is a usual thing. The visitor center shows how big the trees are in comparison with famous monuments and things. The giant trees here are compared to the size of the Statue of Liberty, Titanic, the great blue whale, and regular trees. People are mere dots. Some of the causes of death of giant trees are due to severe winter and falling down. It would be scary to witness a falling sequoia. I imagine it would be like how a cartoon show would portray that scene, flat like a card board. Seriously, don’t even imagine it. We received more than we sought. It’s not enough to read only what’s in this place or in any national parks. It’s better to experience it and enjoy being with nature. There’s more to it than just watching documentaries or reading blogs like this. We can better appreciate nature and it’s wonders by taking a break from our busy life. Our world is big. We may be mere tiny objects compared to these natural marvels but we can help protect and preserve them. This is Adrian’s Lego Mindstorm robot, panoramabot which he programmed to take panorama pictures using my cellphone. That’s why we were a bit late from our schedule. Picture below shows us passing through “the tunnel log”. This tree fell down due to natural causes and was carved to let smaller cars pass through. We were practically running to make up for the time lost since wandering the giant forest. We had to beat the time for us to see the biggest tree before it gets dark. We highly recommend anyone going here to bring a bug spray or mosquito repellant. And expect mosquitoes and bugs to be bigger than the usual. Remember, you’re in the land of the giants. What can you see in Congress Trail? Not politicians but trees of course. This is a 2 mile paved trail that goes through the heart of the sequoia forest. You can see the famous House and Senate Groups, and the President, Chief Sequoyah, General Lee and McKinley Trees. Unfortunately, we don’t have much time to visit them because it’s getting dark. It was past 6PM when we were in the General Sherman area. One upside here, we get to take several photos with the General Sherman because there’s not much people left. Adrian’s panoramabot was very helpful. According to NPS (National Park Service), the General Sherman Tree in Sequoia National Park is the largest (by volume) tree in the world. Massive. Gigantic. Enormous. Colossal. Monster. Humongous. Approximately, this tree together with other giants in Sequoia National Park and Kings Canyon live between 1,800 to 2,700 years. They’ve witnessed the unfolding of civilizations and they overcame drought & other calamities. What else? They’ve seen how the earth changes. We salute you, General Sherman tree! You’re awesome! We hope that many more generations will see you. But even more, we salute your Maker, our Maker. London bridge is falling down, falling down, falling down. London bridge is falling down, my fair lady. The rhyme dates back from the 1100s when the foundation of Old London bridge was being constructed, replacing the timber foundation. London bridge is a very important structure spanning the Thames River. It became a choice business and residential site in London. From the medieval times, there had been many calamities and repairs that undertook. “In 1962, London Bridge was falling down. Built in 1831, the bridge couldn’t handle the ever-increasing flow of traffic across the Thames River. The British government decided to put the bridge up for sale, and Robert McCulloch, Founder of Lake Havasu City, Arizona, and Chairman of McCulloch Oil Corporation, submitted the winning bid of $2,460,000. Part of one of our camping hopping trips was supposed to be an overnight camping at Lake Havasu City. We didn’t like the Lake Havasu State Park because of the ants that made the campground their home. The lake is stinky and the weather was so hot. There are times when in camping you hit the jackpot (when you have an awesome campsite). But this one was a bummer. Though it was not nice to be here on a 100+ degrees temperature, it’s nice to have a quick tour of this part of the city and learn history. Here are some of the pictures before we drive back to California. This area of the Lake Havasu City is a haven for people who loves to hang out in bars and water sports. There’s a lot of resorts in the area. There’s a European feel around London Bridge in Arizona. They maintained European style of structures. Maybe it’s nice to explore some more next time but definitely in the fall or winter. I was hoping that this year will be a year of camping since we started early. In January, we went camping with the crossroads ministry. We are looking forward to this summer to go to the wilderness but circumstances won’t allow us so I’ll just write something about our extraordinary camping experience few years ago. It all started upon learning that we will be going to Manila, Philippines. We decided to visit the other Manila, which is in Utah. Manila is a small town in the Northern Utah and Southern Wyoming boundary. It is named after the Philippines’ capital, Manila, in honor of the US victory at the Battle of Manila Bay. Contrary to Manila, Philippines, this Manila which is the home of the Flaming Gorge, is a less populated area. At 5pm we can only see a few people. I can’t believe that there were only 300+ people residing in Manila, Utah according to 2000 census. Let’s say it doubled in the next 10 years, it’s only 600 compared to Manila’s million population. Anyway, we love both Manilas. We camped at State Line Cove Campground on the sandy shore of Flaming Gorge on the boundary of Utah and Wyoming. But before we enter the campground, we literally went in and out of Utah and Wyoming border as we drove along curve roads. The scenic views and geological sites are plentiful. As the sky changes color from blue to gray then to bright sunny yellow, the views change as well as we drive along winding roads, from lush green to red/brown rock formations. I love trees! Any place that has beautiful trees such as this is a paradise for me. There is no entrance guard or staff here to check in so you’re on your own to find your reserved spot. I’m glad that my men know what to do. My husband is such detail-minded and good in logistics, so we just let them do their job while Mich and I explore and take photos everywhere. These two young trees have proven themselves to be strong, resilient and dependable. I admit, I laughed and questioned their ability to withstand strong winds but I was reminded of the verse in the bible that says, “Don’t let anyone look down on you because you are young, but set an example for the believers in speech, in conduct, in love, in faith and in purity.” 1 Tim. 4:12. I should have not looked down on these skinny trees because God used them to protect us from calamity. This tent was not only a room for us but also a refuge. It shielded us enough and didn’t make us wet even under very strong winds and rain. It didn’t even get damaged or suffered any broken part. This tent has served us many camping trips until this day. I don’t know if we should be glad that these friendly antelopes here were not intimidated by humans or should we be sorry that we were “intruding” their somewhat commercialized habitat. We didn’t know that there’s a lot of pronghorns and other types of deer and antelopes roaming around here. There’s plenty of them around the campground. And Mich tried to follow them. This was the last picture taken before we sleep. Dark clouds gave us warning about the coming rain. We were joking and laughing. We even played bingo and watched a movie inside the tent. Would you believe that? We were just so secured that God will not let any harm to go near us. Psalm 4:8 says “In peace I will lie down and sleep, for you alone, Lord, make me dwell in safety.” Thankfully, God allowed us to have a good night sleep and let the storm pass in the morning. That night we kept our belongings inside the car and left only what’s needed inside the tent. A tray of Red Ribbon ensaimada (so every time I see this bread, I am reminded of manna from heaven) given by a friend and some bottled water saved us from hunger during the raging storm. As far as I can remember, we were the only tent in that area of the campground. The nearest to us was a small RV camper that left earlier than us. Around 8 AM, the storm was gone. The sky was clear and the sun shone brightly as if nothing happened. We prayed and thanked God for His covering, protection and provision. A quick visit to Pier 39 includes people watching. We, or I in particular, love to see diverse people and observe what they do, what they buy, what they eat and many more. I love to see colors and life in every stores and things sold everywhere from souvenirs to candies at Pier 39. I would encourage our kids to buy local fruits than candies. But kids are kids. They’re attracted to candies especially the weird ones. Funny as it seems, the main reason why I want to go here was to see sea lions but we only saw one. A lazy looking sea lion. Looks like they all walked out. Maybe we missed the right time to see them here. Anyway, to compensate the missing sea lions, here’s one of the best sunsets in the Bay Area. Dining to a very dramatic sunset was a treat! Birds are interesting animals. So are seagulls. One time, my family and I went to a beach, and there were two other men who were feeding the birds. 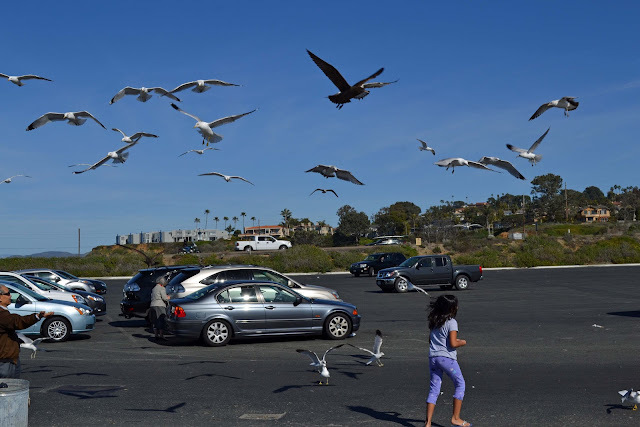 My mom brought chips, and we fed the seagulls until we ran out. Whenever I threw part of a chip to the back of the birds, they were ready to fly away. But as soon as they saw the food, they darted straight for it. It was just so fun! I tried making a path of chips so the birds would get closer to me, but I couldn’t, because it was windy. I was disappointed when we had to leave, but it was still fun. I remember when I was still sitting in the car. I wasn’t sure when my mom said,”Come on, Michelle! It’ll be fun!”(or something like that). Soon, I found myself feeding birds, and having fun! While we were feeding the birds, I saw a man holding a “to-go” box with leftovers, then he tossed it to the birds. When he left, I saw a huge brown seagull swoop down and grab the box. Another time, my brother, Adrian, throw a chip at the birds, then two birds ran into each other, because they were heading for the same chip!